During a stay at Thiruvarur, I was directed by the locals to Kodikkarai (Point Calimer). 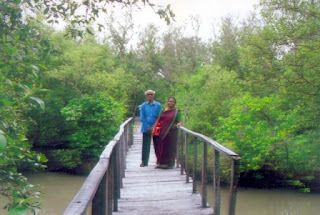 However, my mom said, “Let’s go to Muthuppettai Mangroves”. Hmm… Why not…Why to dump myself in Kodikkarai where everyone else does the same, when a lovely secret place is available. 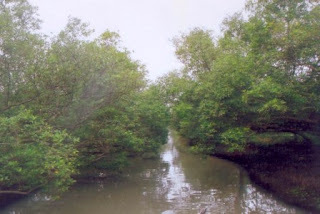 A road less travelled, that is Muthupettai (Muthupet) Mangroves. Now when I opted this, came the other option as well, from the locals, Udayamarthandapuram, a bird sanctuary. The route from Thiruvarur, took me to Udayamarthandapuram first. Taking a rented car, we started off. After crossing Thiruththuraippoondi, I started to look out for the forest range officer. Well, a visit to this Bird Sanctuary requires a prior permission from the forest range officer. So, we reached Udayamarthandapuram and crossed it as well. Hmm… Ok, let me be clear. 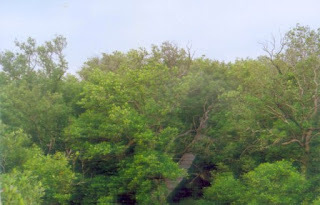 The forest range officer’s office is near the Muthupet Busstand and Muthupet Bus stand is beyond the turn that has to be taken to reach Udayamarthandapuram. Like many other places like, this place also irritated me with its two bus stands - The old bus stand and the new bus stand. I was told that his office is near the bus stand without specifying new or old. After a little bit of search, I found the officer and got the permission both for Udayamarthandapuram and Muthupet. 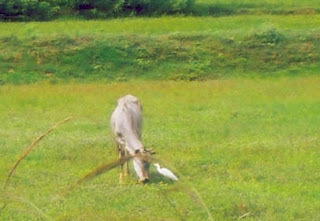 The person in charge at the sanctuary premises was informed about our arrival. Then, a small drive back in the route we came and few more twists and turns and ahoy, here was Udayamarthandapuram! Udayamarthandapuram was a typical village with a road just wide enough to fit a car perfectly, with roosters and hens and goats roaming all over, with village women doing their daily chores, with small eco friendly hut houses. Then there was a hoarding welcoming the visitors of the feathered companions, and there was a grill gate. As such the place didn’t look much like a sanctuary. We were then invited by the person in-charge there and were given binoculars. Then he took us inside, the place was just awesome. There were those trees with soil bunds beneath them and washed afresh with the previous day’s rain. 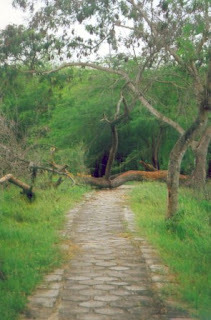 A pathway is present within the sanctuary for us to explore all by ourselves. So green, so fresh, so alive, it was so really very good. The size of the sanctuary is pretty small covering only 500 sq.m. Yet it is the living space of several migratory birds. This sanctuary was created in 1999. And the regular visitors here are as far as from Central Asia, Tibet, Ladhak and even Russia. Just imagining the jet lag, we would have if we travel all the way from Russia. 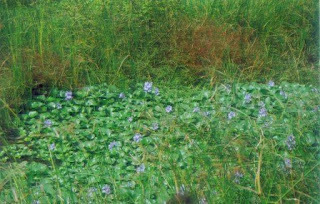 Ahem… Well… Some of the regular feathered friends are Garganey, Common Teal, Little Grebe, Purple Moorhen, Pheasant tailed Jacana, Egrets, Night Heron, Small blue kingfisher, Little Cormorant, Treepie, Woodpecker, Koel, Brahminy Kite, Whoa…. The list goes really long. There are few trees, a wide pond and that’s it. But within those are several hundreds of birds. I should have taken a voice recorder, the non-stop chirping of birds was just awe inspiring. Music to the tired ears of traffic jam horns and cell phone ringtones. A wonderful thing is the endangered species Open Billed Stork which gathers here in numbers even upto 4000. It was a fantastic time till noon and then we bid adieu to the feathered friends and say hi to the finned friends. Well, now it was time for the Muthupettai (Muthupet) Mangrove. After a 10km drive, we reached Muthupettai. I don’t know why, but it reminded me of MCC, Chennai. It was pretty similar, with the sun’s rays shying away. There was again this person in-charge and I met him. He wanted me to write a letter stating who we were and why where we there. I found it silly, still those were government requirement. So, I wrote on a sheet of paper borrowed from him, about who we were and that we were tourists and wanted a boat to have a trip of the mangrove. It was only later I found that, this place was very sensitive and had some religious clashes earlier. So everyone has to go through this process. Then the officer found a boatman for us. He said the motorboat trip would be 650 bucks, and I was astonished. Then I made up my mind. I had come all the way from Thiruvarur and rented a car and there’s no point missing out on the boat ride. I paid him half. He informed me to buy few eatables, and question marks flew atop my head. Why, to reject this local person’s advice..??? With no shop in sight, I bought a dozen bananas. We then took off. It was like any other ride on a river. And after some time, I could feel the sea. The water became turbulent and the depth was hell. It was no more like a river, it was like sea, just sea. As we moved into the sea, the view got all the more fantastic. It was multitude of sea water and little lands here and there. Breathtaking view, it was. Then I said after some time, “Why not return.? We’ve seen enough views of sea and tiny island-lets”. The oarsman said, “Ok. I’ll drop you at that island. You see everything and get back. I’ll wait”. Oh, is it.? So, the trip includes all this, too… Now I knew. 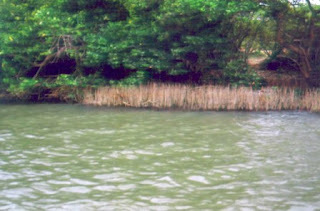 We were dropped at the island and the boatsman said, he would wait there. His 10 yr old boy, joined us to the trek within the island. The land itself was great. There were planks of wood joined together to make the pathway for us. This pathway was elevated at a height of around 2/3 feet from ground. This was a great idea and it’s called a Board Walk, first of its kind in India. I could trek all by myself, without getting lost. We then started walking. Within few metres was this view-tower. The view from this tower was splendid. Then climbing down, we walked further. Several birds and several mangrove salt water plants with uproots and just no humans, not even one other than us. I even spotted a fox pug marks. I was great as I walked and walked and walked. But, on a serious note, this was not a place for lone girl travelers, for pretty obvious reasons. 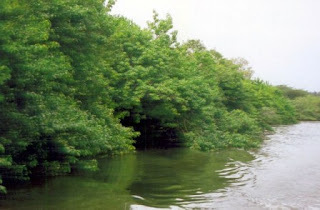 Muthupet is the largest mangrove in Tamil Nadu. This is a huuuuuge place, covering 119 sq. km. 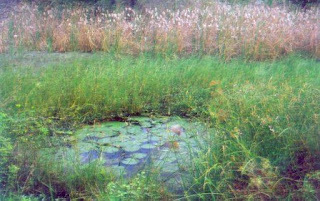 This place has been declared as a Ramsar site and is of global importance in Environment and Ecology. 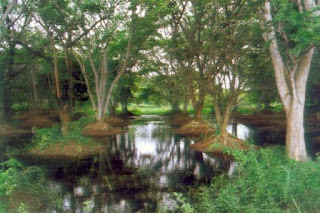 This place too like, Udayamarthandapuram has migratory birds all the way from Siberia, Central Asia, Russia, and even Europe. Now, think about severity of jet lag! Some feathered friends here are Roseringed Parakeet, Spotted Dove, Great Flamingo, Painted Stork apart from those which visit Udayamarthandapuram. Animals here are Jackal, Wildboar, Small Indian Civet, Shortnosed Fruit-bat. Coming to the finned friends, there are about 73 varieties of fishes in here and 6 varieties of prawns itself. 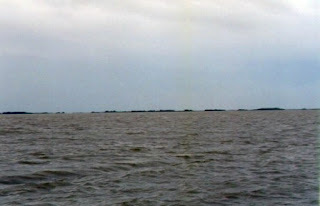 The Lagoon here is called Mullipallam and its the second largest lagoon in Tamil Nadu, nest only to Pichavaram. Then we returned back in the boat. The long ride on the boat (I tell you, it was loooonnnng, an hour into the sea) and the trek had taken a toll on the stomach and it badly needed something. And all that was available there were sweet vada and tea in a local tea shop. But, that was no less than a star hotel buffet at that point of time. I would swear, that sweet vada is a must eat, on a trip there! Here are the scanned pics from the leaflet given by the forest range officer. Nice description. Beautiful photos.Exotic locale. Any photos of the various species of birds & animals that you mentioned ? Hey you managed another quick weekend getaway ! Your narration is terrific - simple, easy flowing,descriptive. I thoroughly enjoyed reading it. Photographs are marvelous. Yes it would have been nice if you could taken some photos of the feathered friends. Next time you travel arm yourself with a telephoto lens attachment to your camera which enables you to take photographs of faraway objects too. Are you aware that you were very close to Vedaranyam - On 30 April 1930 Vedaranyam entered into history books during the Indian Freedom movement. The famous Salt March was successfully completed by leaders like Rajaji and Sardar Vedaratnam at Agastyampalli situated near Vedaranyam. Bird luck is hard luck they say... may be next time. Keep trying! About the birds' pic, I was not lucky enough to click those exotic shots. Anyways, I've added the links to pics from phamplet added at the end of post. And ya, I am aware of Vedaranyam. Gotta catch up with a small trip there soon. Thank you and welcome to my blog. And keep coming too. கன்னுகுட்டிக்கு பேன் பாக்கற பறவை போட்டோ ரொம்ப அழகா இருக்கு. You are very lucky to have so many trips (locally) and that too not very commercial places. Whenever we get LTC, we use to plan a long trip to usual commercial places. I am revisiting your post as I hve a little gift for you on my blog. I really hate going to the usual places... That' why... Why go to commercial places when there are so many un explored arenas...??? 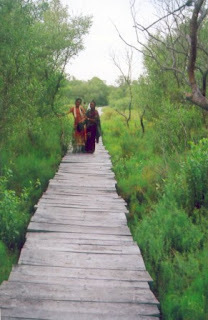 Board walk is an absolute speciality which adds to the charm of the place. I loved it. hi fr TQ for vsit for my native n naturel scene. So nice place...I had been staying at kumbakonam for long time...But i missed to visit this place. Very nice place...I had been in kumbakonam for a long time...But i missed this place.